After 1713, France engaged in a reaffirmation of its territory in Acadia. 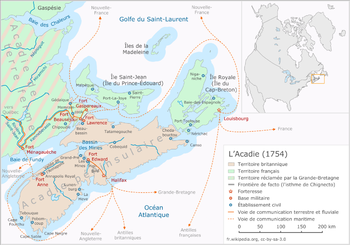 Besides the construction of Louisbourg, France was resolved in organizing a colony on Isle Saint-Jean (present day Prince Edward Island). The beginning of the colony was slow, only 297 inhabitants by 1728. During the years 1740-1750, hundreds of Acadians fled Nova Scotia to exile themselves on this island. The colony went up to 4,000 inhabitants by 1755. Louisbourg fell to the British on July 26, 1758. After two weeks, the order of deportation was given to the Acadians of Isle Saint-Jean and the Ile Saint-Jean Campaign began. The authorities had decided to forgo the initiative taken to assimilate them in the thirteen British colonies, and wanted them returned to France. Around 4,600 Acadiens lived on Isle Saint-Jean. In August 1758, 3,100 inhabitants were captured and deported to France. Others succeeded in hiding or fleeing. Of the twelve ships used to transport the Acadians, three sank; Duke William (364 died), the Violet (280 died) and the Ruby (213 died). In all, 1,649 Acadians, around 53% of the total number deported, died from drowning or diseases. This page was last modified on 6 July 2015, at 02:02.